Padraig Harrington held off a final-day charge from Webb Simpson to clinch the PGA Grand Slam of Golf in Bermuda at his third attempt. Five under-par overnight, the Dubliner birdied the 11th, 12th and 13th and, despite a bogey on the last, was still able to take the £375,000 prize. The Grand Slam features the winners of the season's four majors. 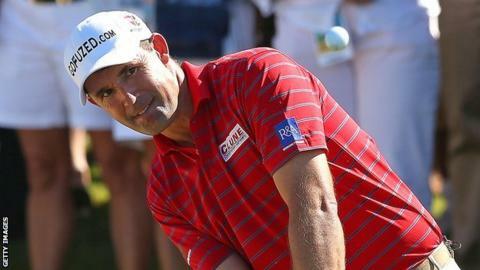 Harrington was a late replacement for Open winner Ernie Els, who withdrew from the event with an ankle injury. Padraig Harrington joins 1991 champion Ian Woosnam as the only two European winners of the Grand Slam title. World number one Rory McIlroy was also absent, preferring to defend the BMW Masters title in Shanghai, and being replaced by Keegan Bradley. Last year's winner Bradley finished tied third with Masters champion Bubba Watson at Port Royal, and it was left to US Open winner Simpson to lead the American charge. His six-under 65, the best round from any player at Bermuda, kept Harrington under pressure to the end, but the three-time major winner held on to take the win. Success in the Grand Slam is Harrington's first on the tour since 2010. He had participated unsuccessfully at Bermuda twice before, losing to Angel Cabrera in 2007 and the following year to Jim Furyk.